Prime Minister of Malaysia, The Honourable Dato’ Sri Mohd Najib Tun Razak, has today (18 December) officially launched the FIA Formula E Championship in Putrajaya and witnessed the signing of the City Agreement between Tan Sri Aseh Bin Haji Che Mat for the city of Putrajaya and Dato’ Sri Johann Young, to officially host the second Formula E race on 18th October 2014. 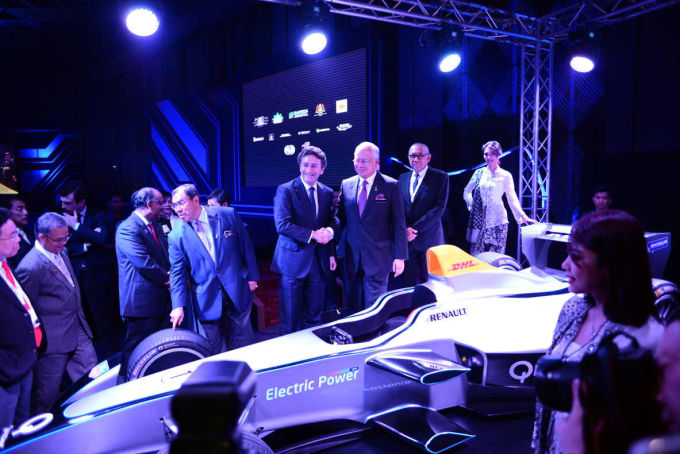 The event, held at the Putrajaya International Convention Centre (PICC), was hosted by Dato’ Seri Johann Young, a founding partner and investor of series promoters Formula E Holdings and Alejandro Agag, CEO of Formula E.
More than 150 invited guests including media, corporate and government sectors were on hand to attend the launch which also saw the new Spark-Renault SRT_01E Formula E car on display – only the second time the fully-electric race car has been shown in Asia. Guests, which also included the Chairman of the Automobile Association of Malaysia YM Tunku Datuk Mudzaffa Bin Tunku Mustapha, were also treated to a sneak preview of the proposed Putrajaya circuit layout which incorporates many of the city’s main landmarks. Formula E is a new FIA Championship using electric single-seater race cars capable of speeds in excess of 225km/h. The series will compete in the heart of 10 of the world's leading cities including Putrajaya, Los Angeles and London. Ten teams, each with two drivers, will go head-to-head to create a unique and exciting racing series designed to appeal to a new generation of motorsport fan whilst accelerating the electric vehicle market and promoting sustainability.